When I started out writing online I didn't know anything about keyword research and I did fine. Then I started reading about keyword research. I tried it and I didn't like it (as my boys say when I make them try one mouthful of a new food.) I went back to my old ways and refined them. I'm writing this article because I didn't find much about writing for search engines that made sense to me when I started in this business. Notable exceptions are GreekGeek and FlynnTheCat on Squidoo, and later Janet21 who started questioning her non-conventional approach. Of course I didn't agree with everything they said! You need to find your own way. Piece together the bits that make sense from lots of sources to come up with your own method that plays to your strengths and avoids your weaknesses. Hopefully you'll find something useful here to weave in to your own approach. Oh and whenever you read an article like this you should always wonder about how much money the writer is making. I earn enough online to support our family of two adults and two kids. Our outgoings are pretty low, other than our gadgets and Lego budget! So basically you are looking for search terms that you can rank well for and which will give you a good volume of traffic. I don't do keyword research by that definition. I do occasionally use a keyword tool. Mostly I use one to check vocabulary because I'm British, not American. It's amazing how many everyday terms are different in the UK and US. I worked for a US company for a long time so I know US business English, but I have to be careful when writing about everyday topics. I said 'awesome' at home the other day. Merciless teasing followed. I do focus on search engine traffic. That's where most of my traffic comes from. I just don't agree with the theory behind keyword research. Well for the kind of things I write about and the way I approach things. YMMV. My focus is affiliate marketing rather than making ad revenue, so that may make a difference too. I'm not just after traffic, I'm looking for buyers. The way I see it is that those popular terms you are targeting with keyword research only make up a certain proportion of the available search space. I don't know the figures, but my instinct is that if you take out the very high competition search terms (like high profile celebrity names) that I'm unlikely to rank for, then much of the remaining search traffic is from unusual searches. 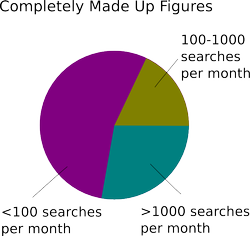 Most of my search traffic has always been from large numbers of different long tail searches - many of the search terms will only be searched for a handful of times. But they add up. It doesn't really matter whether I'm right about the numbers. It's a model to work to and if money comes out the other end then it's a good model. When I get new evidence I adapt the model. So instead of writing articles that target an exact match search phrase, I target the wider search space around a topic. It seems like there's more potential traffic there and less competition because everyone else is so focused on keyword research! This means you need to know your domain vocabulary well. Of course, I sometimes end up ranking for popular terms too, but that's not really my primary goal. What Does Your Search Traffic Look Like? Most of my traffic comes from the keyword phrases I targeted my article at. Most of my traffic comes from lots of different long tail searches. Another problem I have is that keyword research inherently relies on old data. What do I mean by old data? I mean searches that have already happened! I don't care about that. I care about what people are going to be searching for in the future. My articles will be (hopefully) earning me money in the future, not in the past. I like to write about gadgets. If I wrote about what was popular last year (or even last week! ), I'd often miss the mark. This is where knowing your subject matter comes in. Here you need to do market research, not keyword research. What are the trends in topics you're interested in? Does your favorite author have a new book coming out? You can use tools like google trends, but that's still pretty old data by my definition. That doesn't mean I write about things that have a very short shelf-life (though I do sometimes.) I try and find things that are at the bottom of their hype curve and get in early. I'll certainly tackle evergreen subjects too, if I feel I have a fresh take on them, something that hasn't been said before, or a more current take on things. I find that there are many topics where search terms don't fit neatly into high volume exact match phrases. There's just too much variation in what people search for. For these topics you could have 10 people searching for the same information and they would come up with 10 quite different search queries. I want to cater to all of them. Of course this isn't as simple as finding a search term that's easy to rank for and then building it in to your content. You need to understand your domain well and view it with an analytical eye. Then you'll be able to spot topics like this. Keyword reseach certainly works to some degree. I can crunch the numbers and produce articles that do okay (I did try it for a while.) They're never my best articles though. Maybe keyword research works better for you than it does for me because you have a different style, or different skills. Maybe I'm missing the point with keyword research, and would do better if I used it. But I'm not convinced. You can try and convince me if you like. Is Keyword Research The Best Way to Get Search Engine Traffic? No. Throw your Keyword Research tools away. I have definitely thrown my kw research tools away (kind of). I used to waste a lot of time doing kw research - time that would have been better spent writing high quality articles. These days I have the advantage of knowing a bit about some niches (products that I want/own) and terms people tend to type into the search engines - but in general, I find that your approach of writing what you know about works very well. These days I would highly recommend that people just write about popular products that they know about and can write high quality articles on. The problem I have with worrying about keyword researh is that it can make articles look unnatural. There i a tendency to write for robots not people. I want my articles to be readable and for people to come back a red more of my work. It's ok to get random hit but much better to get loyal reader. Google is starting to change the way it judges page for ranking and is now looking for more natural language. Generally yes, but I've had success both ways. Before I knew about keyword research, I still got traffic but I was writing about fairly popular stuff anyway. I'm insanely curious about what it is I'm writing about. I'm writing about a topic or product, I learn about it, think of the reader and write it geared toward that particular angle of the day it is therefore LSI rich, I don't use keyword tools, rejected them early on as everyone touted their usefulness. I'm a big believer in writing with a curious nature and I stay on task the LSI occurs naturally and it is that which makes a good article readers find and relate to. Good Branding! Thanks for the breath of fresh air. KR easily eats up a lot of time I could better use writing. I do fall into that trap from time to time. Your take on GKT is spot on, out of date maybe, that evergreen thing keeps me scratching my head. I guess what I will take away from your insights. Write for the reader, not GKT or other paid KWRT's. Sounds good to me, and a hell of a lot more fun. Be well and enjoy playing with legos, the kidos are only young for a short time..
For some yes. Those that do not know their subject well and try to make themselves out to be experts. Like the experts you talk about that hype keyword research so that you buy, invariably some one else's, overblown product. However, I would not say 'throw it away', I do use KRT's to check whether the title phrase I have in mind has EVER been used, and whether a change in wording might prove more beneficial. I cannot give evidence to show whether this works or not, as I do not write the same article with the opposing titles. Definitely. Go and buy a Keyword Research tool. My online earnings took off once I learnt about keyword research. Don't just use the Google tool though, there are plenty of other great tools out there. Lol SusanM, I would take a keyword with 100,000 search volume and only 300,000 competition any time. My cut off for competition for Wizzley is at <500,000 at the moment! I'm going to place myself right in the middle of this debate - with keyword knowledge is useful but not in the way it is promoted. I don't see the logic of choosing a keyword that has a wonderful 100,000 hits a month but has 300,000 pages that you have to compete with for that traffic. I do keyword research but I tweak it based on my own logic. Like Sam, I also say "don't buy one, the free ones are fine." And I agree that certain ways the tools are used aren't good. But I've found a lot of value in them. For example, I've been able to skip over some topics that simply don't have the volume necessary to be successful. I've been able to analyze products, such as the Harley calendars, to find out that I've probably maxed my earnings from that phrase, and shouldn't worry about promoting it more. I've been able to find out that adding the word "best" to a keyword phrase can help me focus my topic in a way that search engines will approve of, but that sometimes "top" is better than "best." Most of all, the research gave me the information I needed to "break into the game." I use it less now that I know more, but it was a very important stepping stone for me. Yes, but that doesn't mean that you need to buy a tool, there are a lot good free ones around ;-) I do keyword research to get a better idea about what actual people are looking for. Even if I know a topic well, I am often surprised by finding keyword phrases I would never have formulated this way myself. What do I do Instead of Keyword Research? So what do I do instead of keyword research? Well that's a new article in its own right. But mostly I do market research and I follow my instincts. I stick to subjects that are meaningful to me. In many cases, it's what my kids are currently interested in (hence the Lego.) The subjects I write about will change as my kids get older. This keeps it fun and means I'm knowledgeable about the subjects I write about which makes the articles useful and full of the vocabulary and subject matter which will attract search engines. And there are plenty of subjects I still write about just for fun, not expecting them to make money, but because I'm interested in them and have to get the subject out of my system. Sometimes one of those does well by accident! For me this is something I do naturally, but it's not ad-hoc, there is a method in there somewhere. I feel it's a combination of everything until you find what works for you. I still get confused about research for keywords, but I do like to write about what I know and what I think is interesting to others and myself of course..
@Terri You are right, but there are many people who do not have nor ever will have the instincts. They come from innate ability and sometimes from years of experience as a seller. Keyword research gives them a tool to use with statistical numbers that they can rely on. @lakeerieartists My concern is that people do keyword research instead of developing their instincts and doing market research. There's so much written about keyword research that as a newcomer it's easy to think that must be the only way to do things. Keyword research is a good place to start, and it is something that anyone can learn to do. Instinct either develops over time, or is something you just have. Personally, I use keyword research as a starting place, then go with my own experience and instincts. But I have had a lot of time to develop my instincts through retail selling. @SusanM 'I don't see the logic of choosing a keyword that has a wonderful 100,000 hits a month but has 300,000 pages that you have to compete with for that traffic.' I'll definitely cover competition on another page. But I would have missed all of my early successes if I'd avoided high competition topics. If you write richly detailed articles then you'll pick up lots of varied longtail traffic - you don't need to rank for the term itself. I must say I agree with you. I do market research, find myself easily curious about the topic at hand as I'm a naturally curious person with laser single minded focus submerging myself solely in that one topic till it reaches completion I then move on, NEXT! I'm glad to hear that's working for you. I don't like doing keyword research. It takes up too much time. I do a little and that's it. I think writing about what people want to read is far more important.